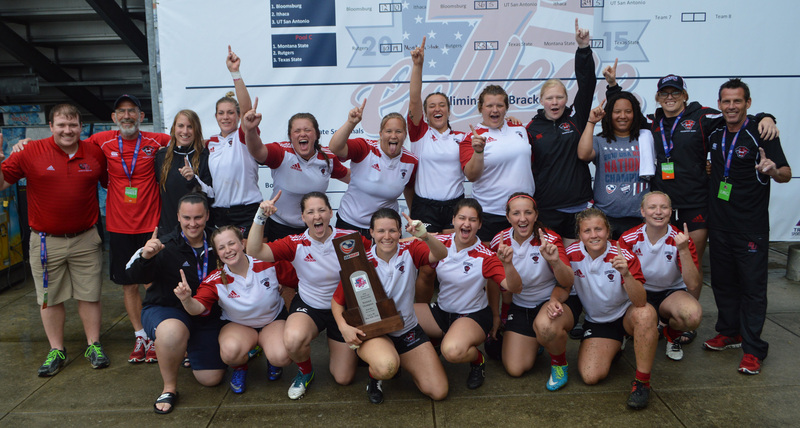 CARY, N.C. – Davenport and Minnesota-Duluth claimed sweeps of the Division II National Championships Sunday at WakeMed Soccer Park with 2016 USA Rugby College 7 s National Championship Cup Final victories. The Panthers out of Grand Rapids, Mich., finished the two-day Women’s DII competition undefeated three weeks after defeating Southern California in the 15s National Championship match in Moraga, Calif., while the Fighting Penguins earned redemption against top-seeded Wisconsin-Whitewater in the Semifinal before dealing with Saint Louis in its Final Sunday. Coach Greg Teliczan pointed to the short time span between the 15s championship and this weekend’s event as a reason for Davenport’s slow start, but the Panthers only let up 15 points while scoring 76 in the three matches leading up to the Cup Final against Bloomsburg. Nicole Snyder and the Huskies nearly derailed Davenport’s bid at a 15s National Championship back in the fall of 2015, holding a lead after 40 minutes of the Fall Championship Semifinal. AIG Women’s Junior All-American Danielle Ordway and the Panthers recovered from the early setback in that match to score 38 unanswered points. “We came out a little flat, got the shakes out,” Ordway said, echoing Teliczan’s statements regarding her team’s performance on Day Two in Cary. “We have a good rivalry with [Bloomsburg]. They’re good competition for us so it’s nice to have them around because, with our fall season, we kind of blow teams out. Just give Ashlee Byrge the ball and good things will happen! Wasting no time in taking a stranglehold on the match Sunday, Ordway, the Most Valuable Player of the Final, opened the scoring in the third minute. She followed fellow All-American Ashlee Byrge over the try line a second time to end the half with a 17-0 lead. Snyder’s two second-half tries bookended a five-pointer from Makala Ferguson, finishing off cohesive attacks from the Fall Semifinalist to put more points on the scoreboard against Davenport than any team could over the weekend. The championship effort still came up short at 24-14. In Denver last year, Minnesota-Duluth’s quest for a DII sweep came to an end at the hands of the Warhawks from Wisconsin-Whitewater in a Cup Semifinal. Facing the same draw Sunday, the Fighting Penguins played “Duluth rugby” to reach its first College 7s Cup Final. Saint Louis had come off of a defeat of Lindenwood-Belleville in the Semifinal, but did not have the same kind of firepower in the Final to counter Duluth, losing, 31-5. “We had two very tough games,” Duluth Head Coach Jeramy Katchuba said. “Hats off to Whitewater and SLU – they played great. Our boys just came out and performed, and stepped up over adversity. The Warhawks ended College 7s on a high with a 29-12 defeat of the Lynx in the third-place match, sending Whitewater into the upcoming 15s season with a potential target of facing Duluth once again.